Opening Sentences (sort of): Peter snuggled deeper into Uncle’s lap as the carriage clattered through the valleys of Switzerland. Baby Annette slept in Mother’s arms, a small pink blossom against a wall of black. 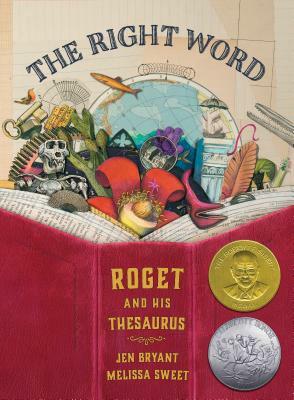 Synopsis: Excellent, fascinating biography of the man who created Roget’s Thesaurus. He began making lists at the age of 8, lists that eventually grew into the thesaurus that we still use today (in various editions). Melissa Sweet’s illustrations are a wild conglomeration of typesetter’s letters, penciled lists, botanical prints, all kinds of things — and they’re fascinating to look at and read and take in. It’s the sort of book an older child could pore over for ages, over and over and over again. Activities/Resources: You can see the book trailer and find links to interviews, articles, and other resources at Jen Bryant’s website. At the website Art of the Picture Book, you can find an in-depth look at Melissa Sweet’s illustrations, along with examples.